When we decide on a new smartphone these days, it’s not just about the capabilities of the phone itself, but there is also the question of the software ecosystem, as well as the hardware ecosystem. We all have our apps that we can’t live without on our phones, and for me the strong integration of Microsoft and Office functionality into Windows Phone makes it the winner for me. As an added bonus, I’m an Xbox music subscriber from back in the day when it was Zune branded, so having that tight integration with the phone is a big plus for me as well. In our household we have two Lumia’s, which I decided upon knowing that I was going to be the support person for the other phone anyway, so I might as well support something I know and understand. While I have a black Lumia 920, my wife wanted something a bit little more svelte, so she has a bright yellow Lumia 720. Yes, the colours are important, but you will find out more about that soon. Like many households these days, we have a few too many USB chargers and Micro USB cables, but they aren’t always in a convenient location, so I finally bit the bullet and got a hold of a couple of different wireless charging stations. Knowing my wife’s propensity for questioning my technology acquisitions, and then assuming ownership of those pieces that she likes, there was only one approach I could take with the wireless chargers. A his and a hers, that couldn’t be confused with each other. 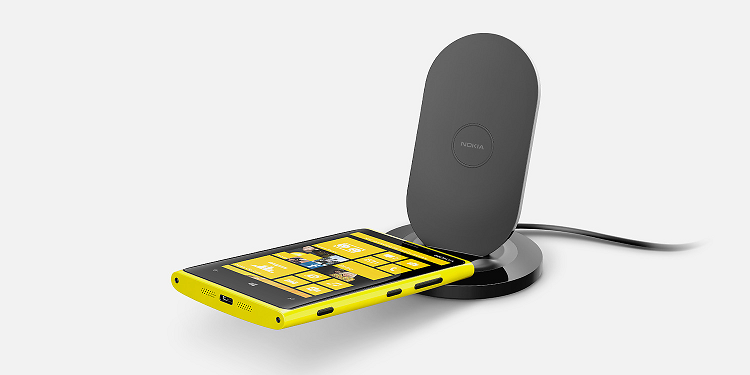 I ended up with a black DT-910 Wireless Charging Stand, while she was the recipient of a yellow DT-900 Wireless Charging Plate. As you can see from the above photo of the wireless stand, once the phone is placed into the charging station you can see it more easily than a phone sitting in a random location with a cable plugged in to it. This occupies the premium real estate between my keyboard and primary monitor, which means not only can I see incoming calls easily, I don’t need to worry about fumbling around while plugging and unplugging, and I don’t have to worry about the Micro USB cable contributing to the mess of cables that are already on the desk. Because my wife uses her phone as a portable social media device and not a big fan of taking or making phone calls, the upright position supplied by the Charging Stand isn’t as critical for her, instead she just wants to put the phone down and not worry about plugging it in to charge, which was a regular occurrence. Because the charging plate is yellow, it’s not something that can be easily overlooked in its resting place so she has a not so gentle reminder to charge. While the 920 has wireless charging capabilities built in, you will need to get the charge covers for the other Lumias – here I’ve got a picture of the 720 and 925 charge covers, and while you can see that the camera and flash locations are going to vary on a model by model basis, there are also some variations in the position of the charging pins on the phones and the covers, so you do need to ensure you have the right cover for the job. As our phones have gotten more capable, we have all been caught out with an inadequate charge, and while we can charge at home, in the office and in the car, charging while on the go hasn’t been that feasible an option. Nokia has released their entrants into the charging on the go market with the DC-16 and DC-19 USB chargers. The DC-19 provides 3200mAh compared to 2200mAh for the DC-16, so it is going to provide a bit more power on the go, but I generally find that the DC-16 is more than adequate for my needs as I’m rarely away from power for an extended period of time. The final addition to our Nokia family was a set of the Nokia Purity Headset by Monster. As you would expect from Monster, these are bass heavy, so if you like your music that way and want a headset that has great noise isolation and 5 different sized earpiece tips to get the best comfort and fit. Easily accessible controls for media, volume and call taking, along with a great tangle resistant cable make these a great addition to your Nokia. That said, from a sound perspective, the included headphones with the 920 and 925 are great sounding, but I’ve found that they aren’t the most comfortable when being worn for extended periods. The blue headset stands out easily, so if it’s in your bag or on your desk, it’s not going to face into the background like the included black headphones that normally ship with your Nokia. Here’s a closer look at the controls – you can see that it’s simple, and also effective. Being able to choose from the five different earpiece cover sizes will really help you get that right mix of comfort and external noise isolation.